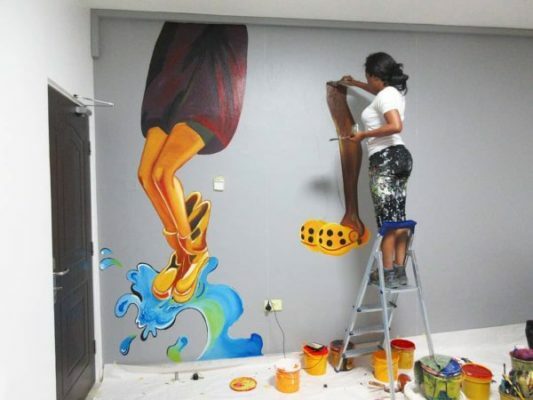 Sarah Sanni(CeraCerni) is a 29-year old inspiring young woman who is slaying effortlessly in the field of wall design and decoration in Nigeria. She operates the Cera Cerni Company in Lagos, Nigeria. Cera Cerni provides decorative services in the form of wall painting and drawings to homes, offices, hotels, beauty houses and salons, schools, baby rooms, bridges and general outdoor designs. Wall mural is a new and fast growing sector in the interior decoration field. A mural is any piece of artwork, painted or applied directly on a wall, ceiling or other permanent surface. The female muralist has a small team with extensive mathematical, sales and marketing skills, all of whom will be invaluable to the new venture. Cera Cerni has worked in various schools across Nigeria, handling all their cartoon drawings. Cera Cerni has had the opportunity to design the poolside of hotels, game houses, offices, private homes and salons in the Lagos Island suburb. According to her, “from desk and field market research carried out on some clients, it is clear that there is considerable potential in the wall design business”. Sarah has been drawing since she was 7 years old but started painting professionally three years ago. Although, muralists are not popular in Nigeria, Sarah’s interest in murals was spurred by poorly-drawn cartoons, especially on school walls. Oftentimes, when she tells people the nature of her work, they are surprised it could be done as a full time job in Nigeria. Below are some of her works and if you want your walls to speak, think Ceracerni!! !